Photo by Jacqueline Bennett Gov. Dannel Malloy, Lt. Gov. Nancy Wyman and U.S. 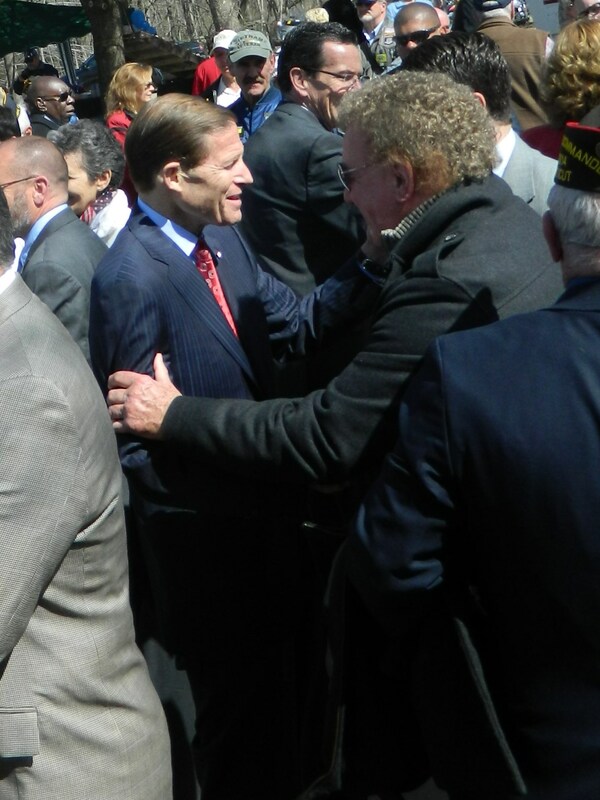 Senator Richard Blumenthal joined Middletown Mayor Dan Drew and CTHM committee members for the April 17 groundbreaking in Middletown, Connecticut. 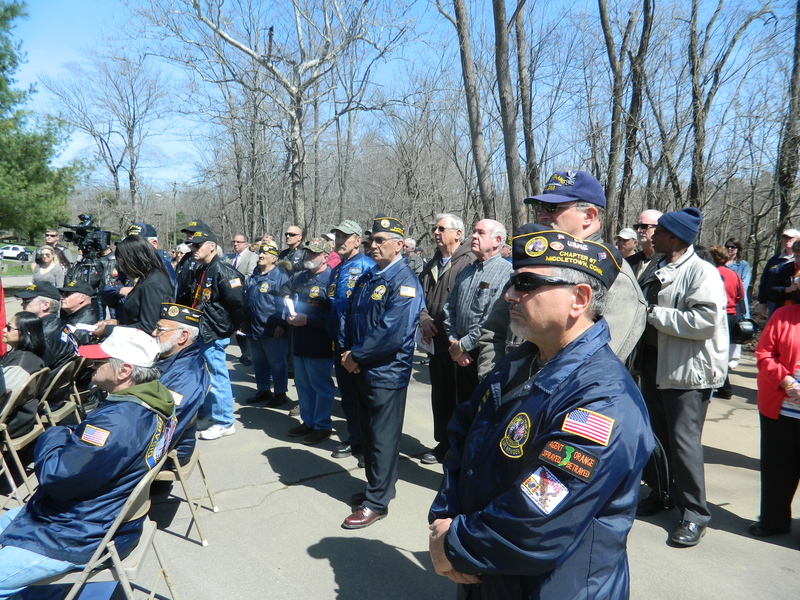 The state’s top officials turned out April 17 to break ground for the CT Trees of Honor Memorial in Middletown, Connecticut that will honor the state’s 65 fallen in the wars in Iraq and Afghanistan. Shovels in hand, Gov. Dannel Malloy, Lt. 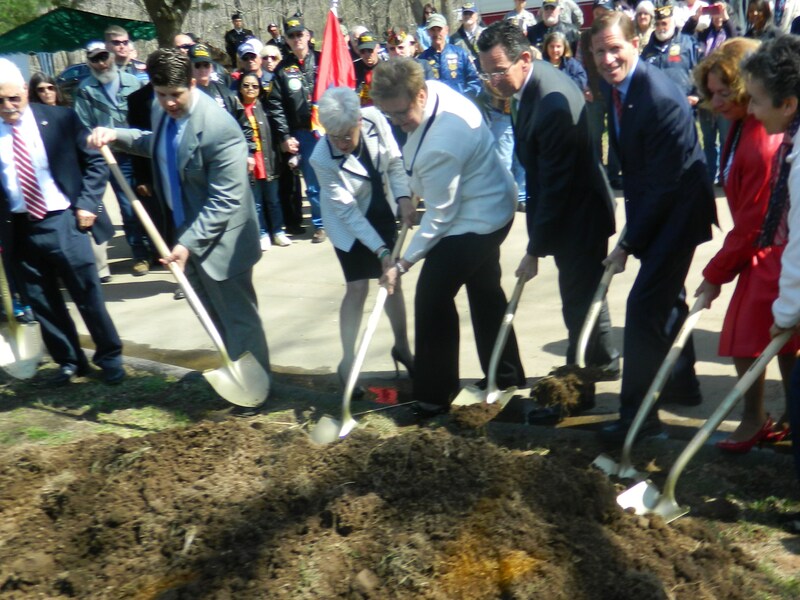 Governor Nancy Wyman, and United States Senator Richard Blumenthal joined Middletown Mayor Daniel Drew and members of the CTHM Committee for the afternoon ceremony in Middletown’s Veterans Memorial Park, where construction of the memorial will get underway in May. “What we are marking here today is a very different type of memorial, a memorial for the lives of those who have fallen,” said Malloy. Inspired by one citizen’s desire to make sure their sacrifices are remembered, the living memorial will feature a variety of flowering trees, one in honor of each of the 65 Connecticut lives lost to be accompanied by a descriptive plaque about every soldier. “Thank you for believing in me,” said Susan Martucci, a Blue Star Mother and chairman of the CTHM Committee, who started the project. 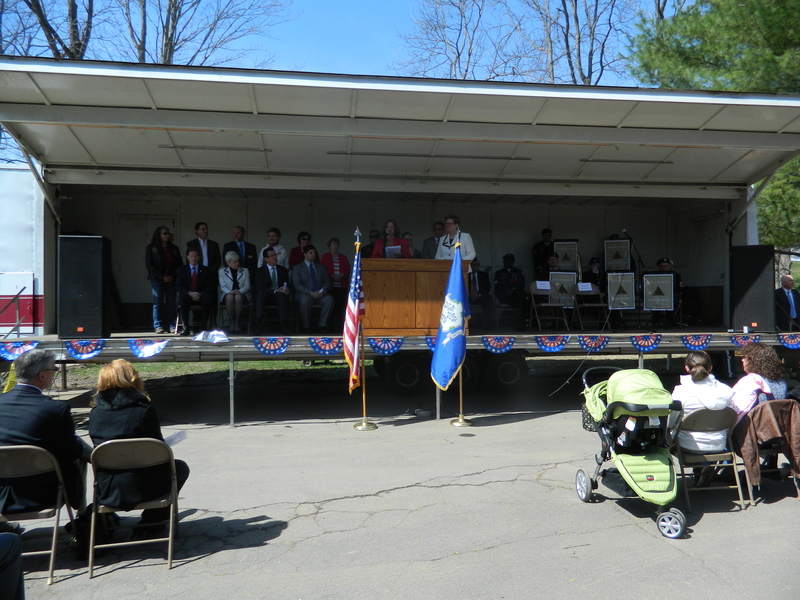 Having a daughter who came home safely after serving two tours of duty in Iraq, Martucci recalled the “heart wrenching” feeling of attending funerals for Connecticut’s Gold Star families – those who lost a loved one in the wars. She decided something more needed to be done for them. Gov. Malloy addresses the group. “This is a grassroots effort,” Martucci said. Susan Martucci, Gov. 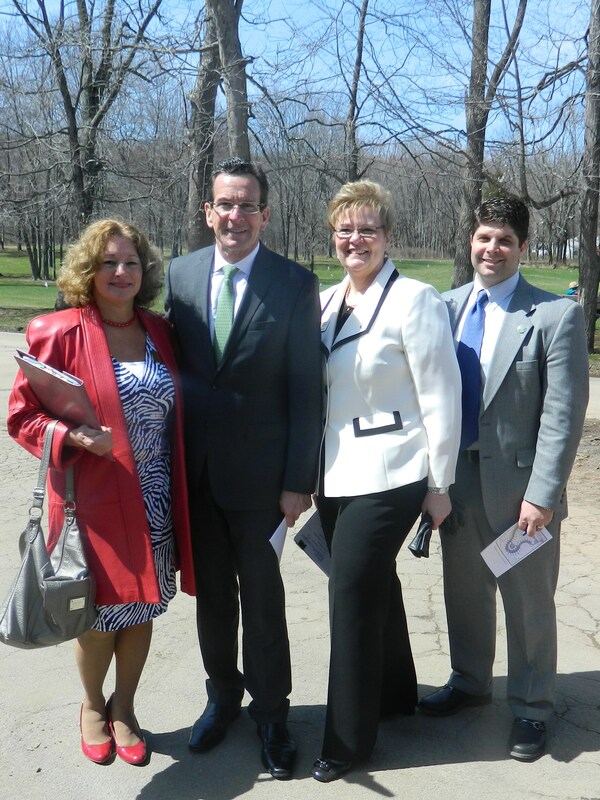 Dannel Malloy, Diane DeLuzio, and Mayor Daniel Drew. 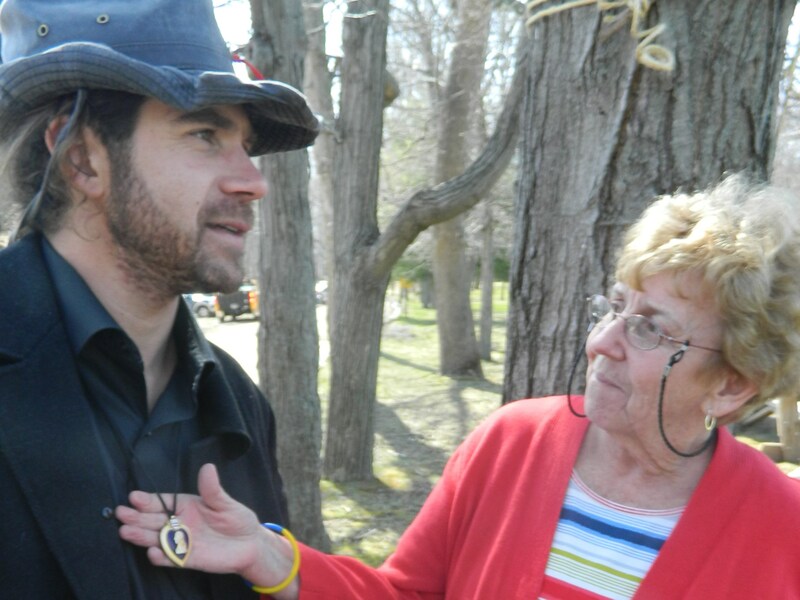 She sought help and found it in Gold Star Mother Diane DeLuzio, Ann Walsh – coordinator of Send Hometown Windsor to the Troops, Nancy Rousselle and Sue Risley, original members of the CTHM Committee which has since grown. 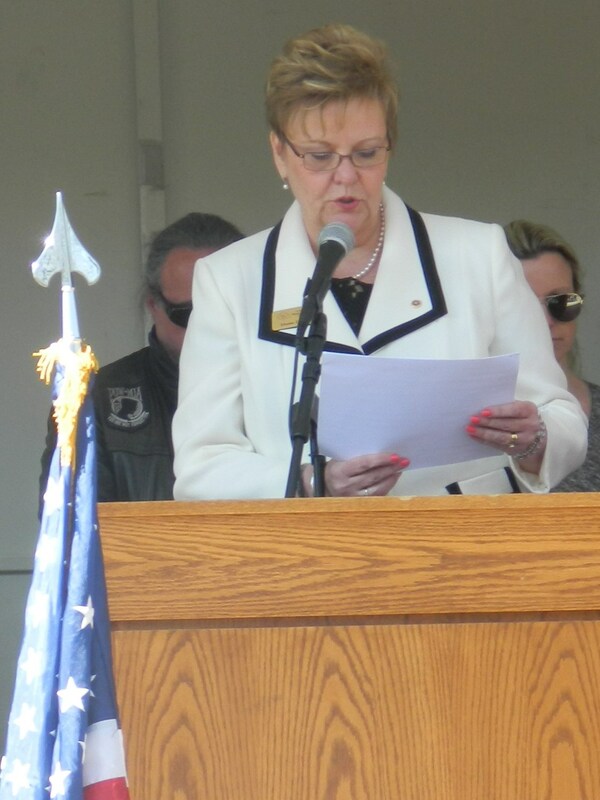 Gold Star Mother Diane DeLuzio reads the names of the 65 fallen. Reading the names of the sixty-five fallen at the ceremony on Thursday, DeLuzio became choked up, touching her hand to heart when she came to her son, SGT Steven DeLuzio of Glastonbury – killed on August 22, 2010 in Afghanistan. Wyman and well-known Connecticut broadcaster Brad Davis, a Marine Corps veteran, collaborated on another memorial to the fallen, the Wall of Honor located in the state Capitol. Wyman offered special thanks to the committee members for their perseverance to create a living memorial. “This is the day you’ve been waiting for,” she said. Known for his advocacy on behalf of veterans, Blumenthal said the memorial will serve as an inspiration to children to grow up and serve the nation as his two sons are doing now, and, will be a place of comfort and beauty for the families of the fallen left behind. “I hope I have an opportunity to come here when no one else is around,” Blumenthal said. Purple Heart recipient Matt McDonald served two tours of duty in Iraq, shown with Ann Walsh of Windsor CT, a member of the CTHM Committee. Though the memorial is not yet built, the site is already a source of comfort and contemplation for Purple Heart recipient Matt McDonald, who served two tours of duty in Iraq. A former member of the CTHM Committtee now working for the Veteran’s Administration, he is open about his struggle with post traumatic stress disorder. He credits some of the strides he has made to the tremendous compassion shown by the women of the CTHM Committee for those of his generation who served in Iraq and Afghanistan. “These women…” McDonald said pensively, his voice trailing off. “I came here just last night, I come here a lot,” he noted. He described the CTHM site as “the Arlington of Connecticut”, referring to Arlington National Cemetery. Drew spoke of the unique challenge faced by the current generation of warriors fighting global terrorism, a “nebulous” enemy in a post 9/11 world unlike the more overt threats of past wars. But said Drew, what remains the same are the principles for which the warriors sacrificed, allowing Americans to remain free. 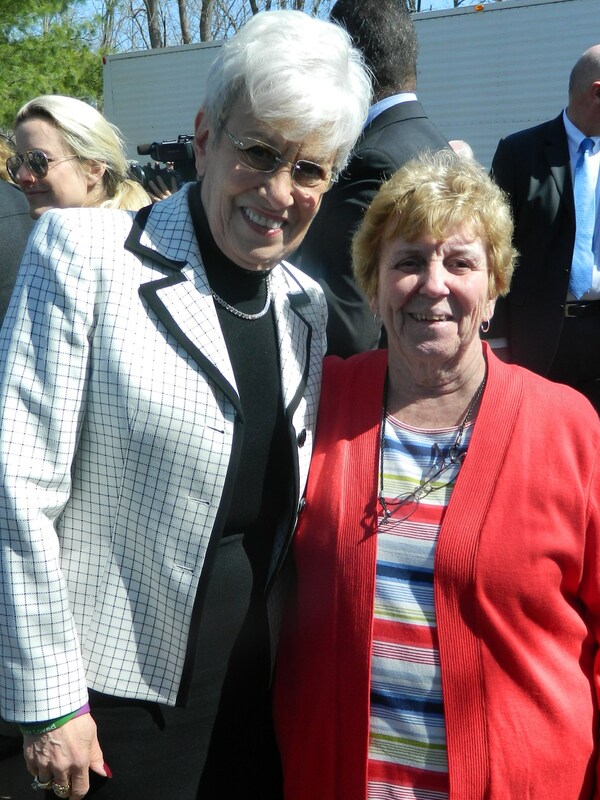 Two women helping veterans – Lt. Gov Nancy Wyman and Ann Walsh. “The principles by which we live as Americans only exist because of the men and women who were willing to put on that uniform and march into battle,” said Drew. Sen. Blumenthal talks with Brad Davis. According to Drew, CTHM is one aspect of overall improvements planned for the park. Phase I of the CTHM has been made possible by private donations. 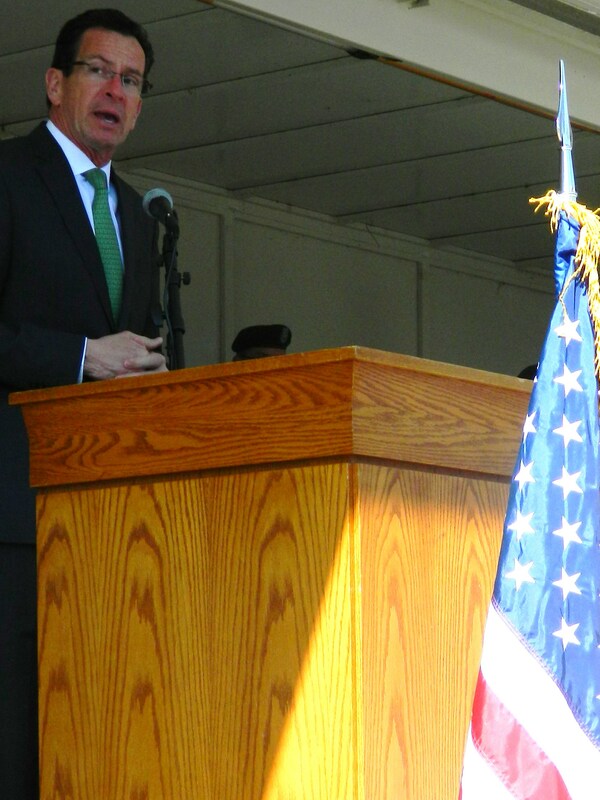 However, Malloy pledged that the state stands ready to do its part. Among the donors have been Gold Star families themselves, those who bought memorial bricks, towns including Farmington and Glastonbury, corporate donations and in-kind services like all the printing for the project paid for by Konica Minolta , donated landscaping design services and money from veteran’s groups. The next phase of the project is in need of funding. Planned are commissioned sculptures, , a special entrance, benches and gardens. Visit http://www.CTTREESOFHONOR.com to find out how to help. How awesome – a dream coming true – I would like to think that all the servicemen who made the major sacrifice are watching from heaven and feeling happy to know they are not forgotten. Thanks to all who worked so hard to make this dream a reality. Jacqueline, thank you so much for this wonderful article. You captured the spirit of the day and the message so beautifully. You have been behind us from the beginning, reporting on our progress and offering your support. On behalf of our committee, we thank you so much! Thank you Sue – glad the ceremony went well. The living trees memorial will be a wonderful tribute.